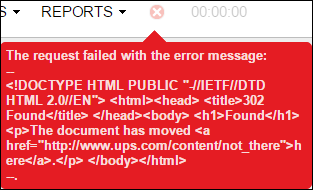 When using Correct Shipment with UPS and Acumatica, you might get this message: The request failed with the error message. If you’re ever using the Sales Demo sample company data in Acumatica, it comes with UPS pre-configured using sample account information. When you click ACTIONS -> Confirm Shipment on the Shipments (SO302000) screen, it will go out to UPS and grab the Tracking Number, then attach the label as an image for each Package on the Shipment. The reason for this error message is that Acumatica is trying to talk to UPS to tell it that the shipment should be voided, but it’s having trouble communicated. The solution is a silly one. Just go to the Carriers (CS207700) screen and pull up UPS. Then, change the lowercase “v” in the screenshot below to an uppercase “V” in the VOID ENDPOINT / UPS Void Shipment Service Url field. Once you save it, go back to the Shipments (SO302000) screen and try ACTIONS -> Correct Shipment again. This time, it should work correctly. I’m sure that this will be fixed in future versions of the Sales Demo sample company data, but if you’re still using an older version, hopefully Google was smart enough to direct you to this post.